A pictorial representation of two sets of numerical data. The saying, "A picture is worth a thousand words," is exactly true in case of graphs. The data represented in a graph is self explanatory. Distance-time graphs provide a variety of information about the motion when compared to the data presented by a table. For example, a table gives information about the distance moved by the bus only at some definite time intervals. On the other hand, from the distance-time graph we can find the distance moved by the bus at any instant of time. Suppose we want to know how much distance the bus had travelled at particular time (8:15 Am). We mark the point corresponding to the time (8:15 AM) on the x-axis. Suppose this point is A. Next we draw a line perpendicular to the x-axis (or parallel to the y-axis) at point A. We then mark the point, T, on the graph at which this perpendicular line intersects. Next, we draw a line through the point T parallel to the x-axis. This intersects the y-axis at the point B. 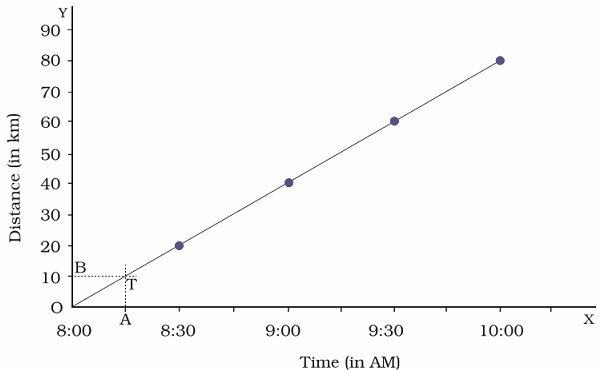 The distance corresponding to the point B on the y-axis, OB, gives us the distance in km covered by the bus at 8:15 AM. How much is this distance in km? Can you now help Paheli to find the distance moved by the bus at 9:45 AM? Can you also find the speed of the bus from its distance-time graph? Graphs are used for better understanding. For example, using these graphs, the performance of two batsmen can be compared, performance of two bowlers can also be observed in a cricket match. Also, in population studies, these graphs are used to compare the birth and the death rate, and other kinds of data. A bar graph is also known as a histogram. A bar graph consists of horizontal or vertical bars that show the values of one quantity against another. These are useful when there is a numerical comparison. For example, it compares the performance of a team across matches in a series. A circular graph used to represent relative percentages or shares of a total. It looks like a pie cut into several slices, and hence the name pie chart. Each slice is called a sector of the chart. A pie chart is used to showcase a whole quantity and the whole quantity is broken into parts. A line that joins dots plotted on a graph paper is called a line graph. It is used to show the variation of a quantity with respect to another. A line graph represents two pieces of information that are usually related. It is useful when comparisons are needed. For example, these graphs are used to represent the changes in speed over a journey. At the centre of the paper, draw two lines perpendicular to each other. The horizontal line is called the X-axis, while the vertical line is called the Y-axis. The point of intersection of the two axes is called the origin, "O". Take one quantity along the X-axis and the other along the Y-axis, after choosing suitable scales for both. For every value along one axis, mark a point matching the related value on the other axis. Join the points, and your graph is ready. The graph for a body in uniform motion will be straight line making angle horizontally. The speed of a body at rest speed is zero at any point of time. Hence, its graph is a straight line along the X-axis. For a body in non-uniform motion, the graph is not a straight line. A diagram showing the relation between typically two variable quantities, each measured along one of a pair of axes at right angles.